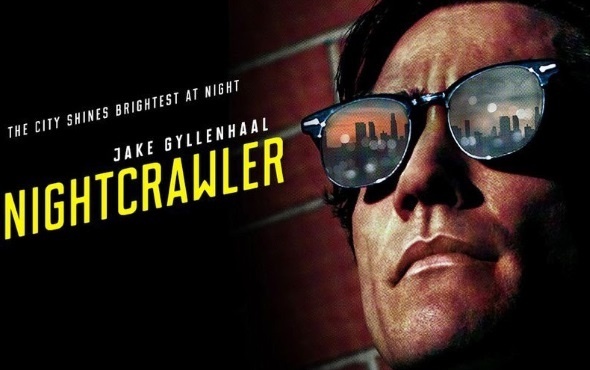 A clever black comedy that emphasizes story over a message (“if it leads it bleeds”), Nightcrawler works in large part to Jake Gyllenhaal’s riveting performance as an aspiring freelance videographer who haunts LA at night, capturing its brutality for sale to local TV news. Gyllenhaal is a mixture of King of Comedy‘s Rupert Pupkin, Rushmore‘s Max Fischer, and Jim Carrey’s Cable Guy, a driven cipher who spouts business motivational doctrine and relentlessly pushes further and further over the line of acceptable journalistic practices in capturing people in crisis or even death throes. You guiltily root for him because he is so compelling and his Dale Carnegie pitch, even unmoored from any concept of morality, comes off as an earnest entrepreneurial pitch. But by the end of the film, a series of tense crime scenes invaded by Gyllenhaal, his philosophy is both corrupting and lethal. He makes it bleed even more that it otherwise would, and as a result, he excels. It’s a simple tale, well told, but there isn’t a lot to this picture other than Gyllenhaal, who exudes a real inner force (while his character is certainly different, I kept coming back to De Niro in Taxi Driver). He has two co-stars; Renee Russo, a hard-bitten struggling TV producer whose star rises with Gyllenhaal’s footage, and LA at night, which writer director Dan Gilroy shoots as a haunted ghost land of deserted streets and foggy canyons. Gilroy is a longtime writer of pretty bad films (Freejack, Two for the Money, Real Steel), but he directs this thriller with pace and verve.